Starbucks recently launched a new, drink-inspired line of ice creams to grocery stores nationwide. The super-premium ice creams include flavors like Caramel Macchiato and Java Chip Frappuccino, the latter of which I picked up last week. Similar to its coffee shop counterpart, this flavor has a coffee ice cream base that is loaded with dark chocolate chunks. The Java Chip Frappuccino actually uses chocolate-covered espresso beans, but it’s a minor difference because the flavors of the ice cream and the frappuccino are very, very close. The coffee flavor is clear and smooth, and the chocolate adds a nice richness to the overall taste. Unfortunately, it shares another characteristic with its namesake: a slight iciness that really isn’t desirable in a super-premium ice cream. It may get this from the relatively small amount of coffee concentrate that is used to flavor the ice cream, but wherever it comes from, you can’t just order it “double-blended” to eliminate the problem. 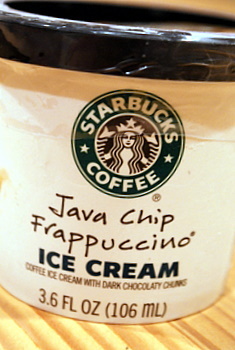 So, in the end, the ice cream is almost too spot-on for the flavor and texture of the frappuccino. It’s good, but not better than some of the other coffee ice cream options out there.